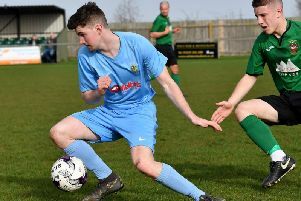 Bourton and Frankton Football Club begin preparations for the new season this week with the start of pre-season training and are inviting new players to join them for the forthcoming campaign. The club, based in the village of Bourton-on-Dunsmore, near Rugby, will again be fielding two teams in the Coventry Alliance Football League on Saturday afternoons for the 2017-18 season, and extend an invitation for new players to join them. With a history spanning over 100 years, Bourton and Frankton are one of the few remaining village clubs in existence in the local area and have enjoyed a series of successes and development in recent years which they are keen to continue to build on. The club continues to offer excellent facilities and have one of the best pitches and playing surfaces in the region, as well as enjoying a thriving social scene along with a variety of fundraising events. Both the club’s teams train weekly at their ground on Main Street, Bourton-on-Dunsmore on Tuesday evenings throughout the course of the season, which gets underway on Tuesday (July 4). A series of pre-season friendlies are already lined up across July and August, ahead of the anticipated start of the new season in early September. B & F have an excellent track record over the years of developing and bringing through young players, and they are particularly keen to hear from and welcome potential players aged 16 years + who are looking to make the transition from junior/youth or Sunday football into Saturday adult/senior level. If you are interested in joining Bourton & Frankton FC for the coming football season – or perhaps know someone who might be, you are invited along to the club on Tuesday evening from 7pm and on any subsequent Tuesday thereafter. Alternatively, if you would like further details, please contact Malcolm Smith on 07982 835571 or Stu McQuillan on 07852 999890.